Tecnorama was the protagonist of the latest ITMA edition recently concluded with an extremely positive result. 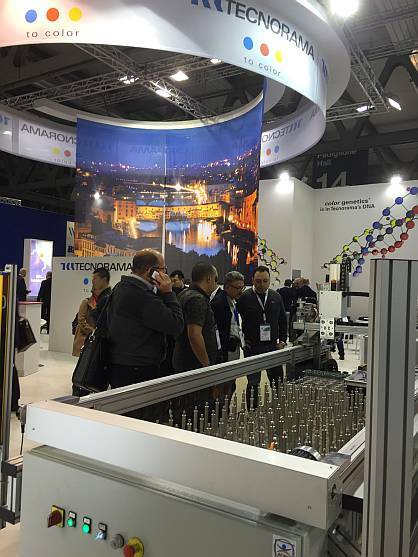 Many visitors crowded the booth every day of the event confirming the prestige that the company collects worldwide. Professionalism, technical quality, constant commitment for innovative solutions for over thirty years have led to the success that the exhibition has just sealed. Many were also sales contracts signed during the fair as a further sign of the leadership Tecnorama gained in the market and a confirmation of the security that customers receive addressing to Tecnorama thanks both to the performance of the machines, and to the assistance that the company provides, always attentive to the needs of each customer. The satisfaction of the results of ITMA, which exceeded expectations, provides a further incentive to continue on the path of continuous research technology, innovation and dedicated assistance. SHAKERAMA is a new system for dyeing laboratory samples, designed and produced by Tecnorama to complete its range of automatic dyeing machines forming part of the DOS&DYE COMPACT system. This machine is particularly suitable for dyeing knitwear and fabric made of all type fibres: natural, artificial and synthetic. SHAKERAMA is conceived to work with groups of more autoclaves carrying out simultaneously dyeing cycles with different recipes but using the same dyeing program. The cooling system guarantees perfect temperature uniformity and regularity for all dyeing units avoiding dyeing reproducibility problems. ECODYERAMA automatically analyses the quality of wastewater during the dyeing process. The water quality is analysed by means of a special optical instrument capable of checking the presence of minimum quantities of dyestuff remaining in the washing water (RGB technology). Easy to use, can be applied on all existing dyeing machines and it is suitable for any type of fibre and/or form of textile material (flock, yarn, reels and skeins, fabrics, mesh, etc.) and can monitor any type of dyeing technique (reactive, direct, acid-based, etc.). More News from Tecnorama s.r.l.